The weather is getting colder, and I was craving soup. I am always freezing and absolutely love soup! 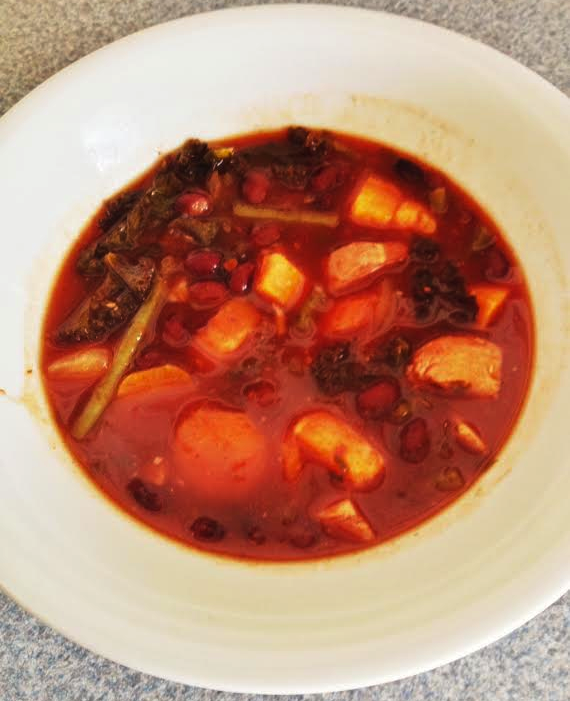 I googled some clean eating soup recipes, and decided to try out this Slow Cooked Superfood Soup from a website called skinnyms.com. It hit the spot! To me it tasted like minestrone, but with sweet potato, and no pasta. I think next time around I will use some more sweet potato, make some homemade chips, add some avocado and ground turkey and do a little spin on nachos. I really liked this one because it was super easy to make, had a ton of veggies and you won't get bored because you could add things to it to make it different. Maybe some whole wheat pasta, for the italian feel, or chips and ground meat for a mexican feel. Either way, it was delicious, it kept me warm, and fed me for 3 days straight so I highly recommend it! Combine all ingredients in the slow cooker, cover and cook on low for 6-8 hours, or until veggies are tender.